John Halm and I go back a long time, i also have run this russell, Back in 1972 or so, with Rodney Pitts as my instructor. Please tell me where I can find information on operateing a Russell Steam Tractor. I would like to fire one up without blowing my self up. i have a russel steam tractor serial number 16263 can anyone tell me how to find out what year it was built. it is 16 h.p. on the draw bar and 48 h.p. on the flywheel. There are 2 old Russel steam traction engines setting in behind a shed at Dowling, Mich. They belonged to the late Harry Woodmancy. I saw one run about 20 years ago there on a saw mill. His boys wont sell I hear. For your information. I have a cast iron seat that the word Russel is in cast letters part of the seat. Can any one tell me what tractor or implement this came from. please send any info or photos of Russell 13 hp traction steam engine. My dad, Joe Hardin of Caulfield, MO sold his at auction. Wondering who might own this gem today. Can you help? Thanks for any infor. I have a russell road grader in working order from 1910.Does anyone know if this is worth anything? My Great Uncle Lyman Knapp who recently passed away ownes a 25 Hp Russel Steam Traction Engine. It can be seen at the Pawnee Steam in Oklahoma. I know I personally re-painted the wheels on it twice as a child. Now every time I see one of these machines, it reminds me of my wonderful experiences with my Uncle Lyman and cousin Lyman. Also my friend Ed Larson.. I do not know if anyone has ever seen or heard of a 1917 Russell 30-60 Giant Tractor? The reason I ask is I work with Wieman Land and Auction Co. out of Marion, South Dakota. We have this tractor coming up on a sale on September 22, 2004. I have been told that there are only 6 or 7 of these left in the world. If you know anything about this tractor please email me! If you want to see pictures take a look on our website at www.wiemanland.com/waltner.htm Thanks! My name is Adam with the City of Midlothian. I have a 1924 Russell road grader that was left in the back forty of my Public Works facility and i understand it was the first road grader for this town. I proudly set it up on a concrete pad in front of my Service Center office. I was wondering should I try to get it restored and if I do, where would I get the materials? Or would it be worth my time. It really looks like its been through some hard working times. I couldnt imagine not having hydraulics or even cab and air considering Texas weather and the hard white rock. Please holler back if you have any comments. I was wondering if anyone has information on the Russell family. My great-great grandpa was the creator of the Russell tractor and just trying to find out more about our history. Any information welcome. Thanks! have recently purchased a 20hp compound Russell steam engine. I am looking for any information and anyone that would be willing to allow me to make copies of some parts I am Missing to have them recast. From what I can tell It was built between 1905 and 1915? Does the national Russell association still exist? I am currently painting/restoring an old Russell Steam Tractor believed to be built somewhere around 1911-1915. I'd really like to find more info on it and a unable to find the rusell collectors web site mentioned above. Would appreciate any advice. I own a 25 hp Russell looking for dimencions of water tanks and canopy pictures will help. The engine I own is #16107 and it can be seen working At Mount Pleasant Iowa Laborday weekend every year. Our family had a 16 H.P. compound engine until a few years ago. The Russell Company's attempt at compounding was a disaster. The engine was very showy but not much to work with. All steam engines are enjoyable to operate no matter what the short comings are. I have tried to find if any other person has an information of an American company which manufactured engines in Australia. Westinghouse was the company and the engines were sold under local names such as Rosebery or Buzzacott. I have a 6HP Rosebery and would like to know if these engines were manufactured in any other country. I am so happy to see my family's Star Drilling Machine in the background of this Russell picture. It sure brings back some great memories. My Grandfather, Harry Robinson, passed away Dec 25, 2001, and I am sure he would be very happy to know that someone (Vonzapp) recognized it. If anyone can recommend a way to find out how one goes about appraising something like this, please let me know. Thank you again. I have a 12 HP Russell Steam Traction Engine. You can see it at the Dale and Martha Hawk Museum web site. We fire it up once or twice a year and hook it up to either the family saw mill or one of the Threashing machines at the museum. I am looking for a Russell Threashing Machine if anybody has info on one email me. John Halm is correct. 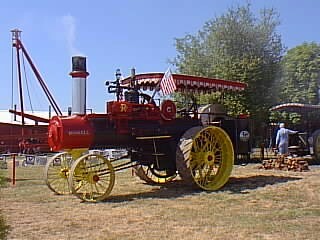 It's a Russell steam traction engine at Brooks, Oregon. I can't tell which size based on the picture, but I suspect John is right. I own a 1916 16/48HP model. They're excellent running and well built machines. See www.russellcollectors.com for more info. The 3 vertical beams in the background are part of the portable Star Drilling Machine owned by the Robinson family. It's a drop drill (impact) drilling rig for oil and water. my dad had a russell built in 1917 ? it was a 6 cylender, each cylinder had a head. he cut it up for scrap in ww 2.i dont have a picture .